Supplied with an 18" chain. Beautifully displayed on a white pad and presented in a lovely blue velveteen gift box. The gemstones are spaced with wiry gold and golden beads, making the jewels pop out. An excellent choice for parties. Design: Fancy. Clasp: S-Hook. ESTABLISHED OVER 25 YEARS. EST OVER 25 YEARS. Beautiful Emerald necklace Dispatched with Royal Mail 1st Class (1 to 2 working days). A PAIR OF SILVER PEARL EARRINGS IS FREE WITH THIS NECKLACE. MAKING OF THIS NECKLACE IN VERY FINE AND IS MADE BY THE ARTISANS WHO ARE MAKING THE JEWELLERY OF DIAMOND. Main Stone Shape Oval. Style Chain. 28mmx16mm pendant solid 14k gold 1mm chain and beads. Main Stone Shape Pear. Style Chain. Stamped 18K, hallmarked “MMA”. The necklace is 21 3/4" long. Style Chain. Main Stone Color Green. Double stacking, wear together or seperate. 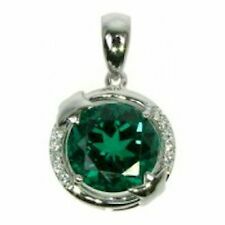 Duet Trillion-Cut Created Emerald Sterling Silver & 10kt Gold Pendant 18"
Main Stone Shape Trillion. Crafted of solid Sterling Silver. 925 and 10 Karat Yellow Gold. Main Stone Color Green. All Sterling Silver in this piece is Rhodium plated and will never turn color. Main Stone Shape Pear. 18" sterling silver chain included. Set in Solid Sterling Silver. Type Pendant Setting. Lapis : 3.5 gm. Diamonds Studs Gold diamond Rings Gold Diamond pendant Diamond Necklace. 14k Yellow Gold Weight: 2.85 Gms. BAR Size : 28.5 mm and 18" Chain. Diamond Bracelet. Birthstone Studs Solid Gold Jewelry Carving Earrings Beads & Findings. We manufacture highest quality of diamond & Gemstones studded Fine Gold & 925 Sterling Silver Jewelry. All our gold and silversmiths are highly creative and skillful having an experience of 15 years or more! Style: ChainLength: 24 - 29.99"
Splitter Size:8-10 mm. High-quality chain endlessly, without closure. Because each stone is a natural product. may cause small variations in form, color and pattern ! Splitter Size:4-6 MM. A practical clasp makes for an easy on and taking off. Because each stone is a natural product. may cause small variations in form, color and pattern !